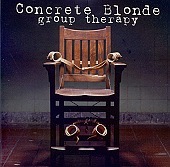 Concrete Blonde's Group Therapy is twelve new recordings from the original members - Johnette Napolitano, Jim Mankey, and Harry Rushakoff. With everyone back in full force, the band has created a wicked, sly pop album with plenty of different textures and faces, stretching the boundaries of pop, often reaching into eerie realms, haunting you with all-too-real vocals before reeling you in regardless of your reservations. This is powerful, provocative music; I'll give it an A.